Let's be honest: sometimes the news can be pretty boring. Headlines tend to strip the irony and comedy out of everyday events, which becomes even more apparent when you ask Alexa for the news. She'll respond, but when she does, it's strictly business. Funny News lightens the mood, giving Alexa a more sarcastic (and a little twisted) attitude toward news headlines, courtesy of the Fark.com public RSS feed. Start using it! 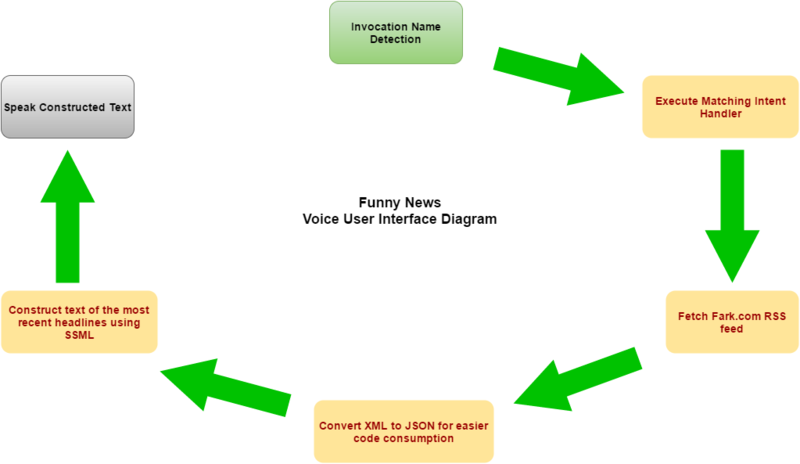 For example, say..."Alexa, ask Funny News for the headlines"
Modify the APP_ID variable on line 10 of src/index.js to be your Skill's Application ID. Save the file. Upload the ZIP file as your Lambda Function Package in the Code tab and save the Lambda function. You are now able to test your Skill on your Alexa device using the Invocation Name you provided in the Skill Information settings! If Alexa isn't recognizing your Invocation Name, be sure that the Enable switch is turned on in the Test tab, then try again. To publish your Skill, be sure to test it thoroughly, confirm that you comply with the Certification Requirements for Custom Skills, complete the Publishing Information and Privacy & Compliance tabs, then submit your Skill for certification! Once Amazon has certified your Skill, it will be immediately available to all Echo users.